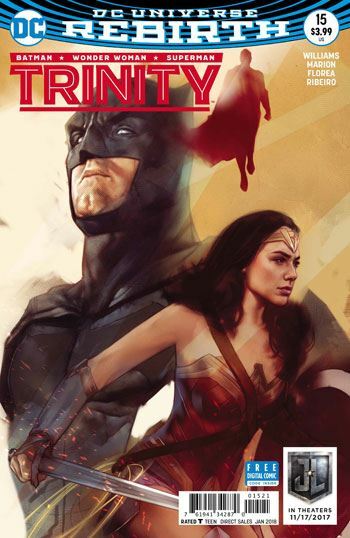 The Dark Destiny storyline concludes in Trinity 15. Circe looks to have triumphed over Superman, Batman, and Wonder Woman as the issue opens, but you just know that won’t last. And, to be frank, the predictability is part of the problem with this final chapter, which all seems to go by far too quickly. There have been some great twists along the way with this storyline, but now all the cards have been played. Oh, sure, there is a betrayal and a survival which were, technically, surprises. But they weren’t very surprising surprises. I do have commend the art, by V Ken Marion and Sandu Florea. It looks just great, and has throughout this arc. Their style is well suited to the supernatural flavour of this tale. And I am glad that Circe has been brought back into the Rebirth DC universe by this tale. Her character does come off as a threat capable of facing the three most powerful heroes all by herself. But when I reached the ending of the issue I was genuinely shocked that the story was already over. It sure felt like it needed at least another page. I actually wound up looking back to make sure that this was the final issue, that it was not meant to continue into the next one. 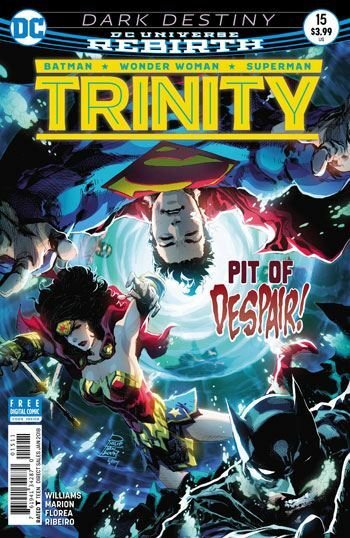 Perhaps the large cast of this story arc, which includes not just Red Hood and the Outlaws, but also John Constantine, Deadman and Zatanna, is part of why this finale seems so rushed. So much to jam in. A shame. It was a strong story arc overall, and deserved a stronger conclusion.